Rebecca Williamson (left) and Ben OShaughnessy are national spokespeople for Young Socialists for Calero and Kennedy, which has already begun campaigning. This column is written and edited by members of the Young Socialists, a revolutionary socialist youth organization. For more information contact the YS at 306 W. 37th St., 10th Floor, New York, NY 10018; tel. (212) 629-6649; e-mail: youngsocialists@mac.com. 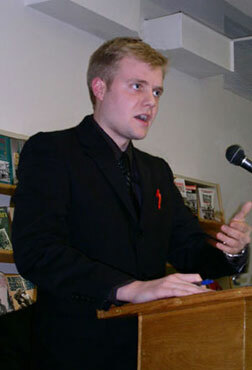 NEW YORKThe Young Socialists for Calero and Kennedy are reaching out to working people in working-class neighborhoods, at factory gates, and on the job to win support for the Socialist Workers Party candidates," said Ben O'Shaughnessy, speaking at an SWP campaign event here January 11. "We invite all youth attracted to the struggles of workers and farmers to join us in campaigning for the 2008 Socialist Workers ticket." Róger Calero and Alyson Kennedy are the SWPs presidential and vice presidential candidates. O'Shaughnessy, a spokesperson for the Young Socialists for Calero and Kennedy, reported on activities of the young socialist campaigners, from street teams across New York to introducing the campaign to co-workers and other youth. He said the candidates are going where workers and farmers are engaged in struggle, from fights to organize unions to protests against immigration raids. Earlier that day, young socialist campaigners joined Kennedy and 300 other people at a rally at the Brooklyn federal courthouse to protest grand jury subpoenas targeting three Puerto Rican independence activists. "We call for the release of Puerto Rican prisoners jailed for their pro-independence activities, just as we join in actions for the release of five Cuban revolutionaries locked up in U.S. prisons," he said. In Minnesota, young campaigners have helped bring the socialist campaign to workers fighting a union decertification drive at Dakota Premium Foods in South St. Paul, Rebecca Williamson said in a phone interview. A worker at Dakota, Williamson is the other spokesperson for the Young Socialists for Calero and Kennedy, and the SWP candidate for U.S. Congress in Minnesotas 5th District. "Our campaign explains that the only way workers can effectively enforce safety and resist speed-up on the job is to forge fighting unions," she said. "We also need to organize in the political arena by breaking with the Democrats and Republicans and building a labor party, based on the unions, that can fight for the interests of all working people." The Young Socialists for Calero and Kennedy is joining SWP candidates on the streets, at plant gates, and on campuses. We are helping organize meetings and debates for the socialist candidates and will petition to get them on the ballot. Get involved! Contact us at ys4calerokennedy@mac.com, through the information in the introduction to this column, or the nearest Militant distributor listed on page 8.